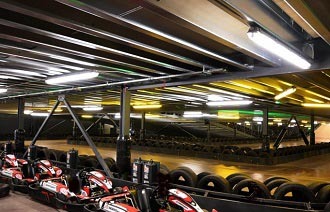 A Hugely impressive multi-level circuit running battery-powered karts. The venue has good facilities and can provide a range of events to suit the needs of any customers from corporate groups to stag/hen parties. At over 400 metres in length it is also a decent size for an indoor track so all drivers will find the layout a challenge. At Junction 4, take the A331 exit towards Guildford/Farnham/Camberley/Farnborough/Aldershot and at the roundabout take the second exit onto the A331. At the roundabout, take the first exit and stay on the A331 to take the exit towards A325/Hawley/Farnborough. At the roundabout take the 3rd exit onto Frimley High St and go through the following roundabout. At the next roundabout take the 1st exit onto Farnborough Road/A325 and go through the following roundabout, then keep right to continue on Pinehurst Roundabout. Take a slight left onto Meudon Avenue/A327 and follow Solartron Road to Invincible Road, taking the third exit on the roundabout onto Solartron Road towards B&Q and Asda. Then at the mini roundabout, take the first exit onto Invincible Road. Continue on Invincible Road and you will find TeamSport at the end on the right.